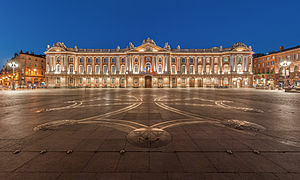 Toulouse is the capital of the French department of Haute-Garonne and of the region of Occitanie, in southwest France. The city is on the banks of the River Garonne, 150 kilometres (93 miles) from the Mediterranean Sea, 230 km (143 mi) from the Atlantic Ocean and 680 km (420 mi) from Paris. Main gallery: Canal du Midi (Toulouse). Main gallery: Capitole de Toulouse. Main gallery: Basilique Notre-Dame de la Daurade.